If you own a yorkie or know someone who owns one, you will find that they are one of the most adorable pets to have! They are very loyal and adorable. Many owners say their yorkies are like little shadows and are very attached to them!!! This wine holder is a very realistic replica to this fine breed and you will not be disappointed with him! This Yorkie wine bottle holder measures 6.5" tall, 11.5" long and 4" deep approximately. This Yorkie wine bottle holder is made of polyresin, hand painted and polished individually. Color Tone may vary from pictures. 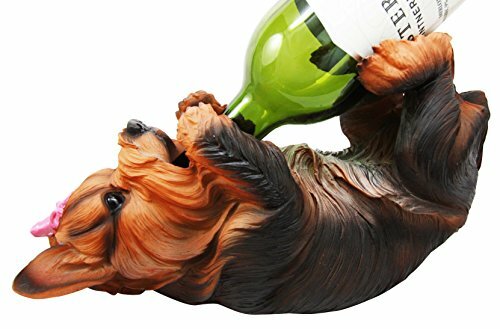 This Yorkie wine bottle holder makes a great centerpiece for your wine cellar or your dining table!!! Give it away as a gift to a loved one too!!! This Yorkie wine bottle holder is an Ebros Gift exclusive collection.